Macau, Wednesday January 23, 2019 – Igniting Macau with the power and intensity of a lightning bolt, the hugely anticipated Elēkron – the world’s first all-electric indoor theatrical stunt show – launched with a bang at Studio City tonight as it excited celebrities, dignitaries and VIP guests at its spectacular world premiere. 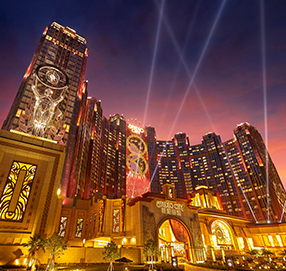 Macau, Thursday October 18, 2018 – Following the phenomenal success of City of Dreams’ The House of Dancing Water, Studio City – another flagship resort owned and operated by Melco Resorts & Entertainment – is raising the bar in live entertainment with the world’s first action-packed, all-electric, indoor theatrical stunt show, Elēkron. Macau, Friday May 25, 2018 – An invasion is taking over Studio City, Macau – and it’s out of this world. Featuring a towering Studio City Rocket launch pad, a colony of fantastical extra-terrestrial creatures, a bustling Space Bar, and a myriad of stellar interactive experiences, “Alien Invasion” at Studio City is set to be the hottest hangout in the universe this summer, letting visitors live out their sci-fi fantasies – just like in the movies. Opened on October 27, 2015, Studio City is set to take Macau's entertainment destination proposition to unprecedented new levels by providing a ‘next generation’ of outstanding entertainment-driven leisure destination experiences that help the territory’s evolution into a truly international tourism center. The Hollywood-themed studio-concept resort is a thrilling new cinematic inspired entertainment and leisure destination and is designed to be the most diversified entertainment offering in Macau. Ideally located on Cotai, close to the Lotus Bridge immigration point connecting Hengqin Island and a future station-point for the Macau Light Rapid Transit (LTR), Studio City provides the ultimate in sophisticated leisure entertainment, hotel, retail, dining and lifestyle experiences. Studio City's stunning Art-Deco facade features an iconic figure-8 Ferris wheel "Golden Reel" gondola ride which straddles the resort's two-tower hotel at a height of some 130 meters. The integrated resort's other innovative entertainment offerings also include Batman Dark Flight, the world first Warner Bros. Batman-themed action-packed motion ride; The House of Magic, a magic theater which offers guests an incredible live magical experience showcasing the world's greatest magicians; Warner Bros. Fun Zone, a family entertainment center for kids filled with Warner Bros.' and DC Comics' franchise characters and play-rides; Studio City Event Center, a 5,000-seat multi-purpose entertainment center designed to host live concerts, theatrical and sporting events; Studio 8, the only TV Studio facility in Macau to provide open access ‘plug in and play’ facilities to create a fully operational television recording and broadcast studio; and Pacha Macau, which brings Ibiza-style nightlife to Macau for the very first time, electrifying Macau's burgeoning club scene.